A gala in New York City isn’t complete without a heartwarming cause, beautiful faces and inspiring tributes. 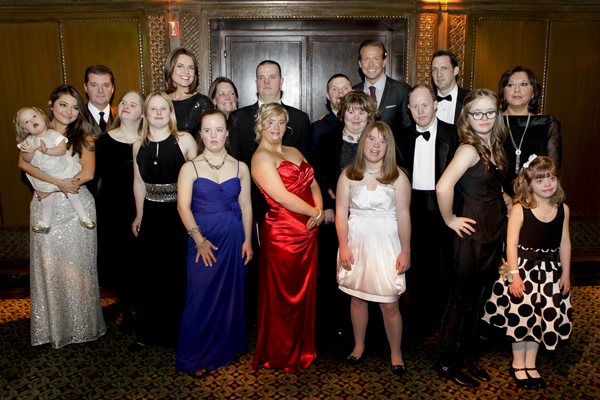 The National Down Syndrome Society delivered on all fronts at its 2013 Annual Gala and Auction. NDSS honored fashion brand Dolores Cortes USA for its commitment to raising awareness for people with Down syndrome. Dolores Cortes USA chose to feature baby model Valentina Guerrero, who has Down syndrome, for the cover of its newly launched kids catalog. Savannah Guthrie, NBC Today show co-anchor and NBC News chief legal correspondent, emceed the event as part of her ongoing support for individuals with Down syndrome. Guthrie’s uncle, now deceased, had Down syndrome. Guthrie credits him as a source of inspiration throughout her childhood. Monica Hillman represented Dolores Cortes USA at the Gala and shared with SheKnows how she came to select Valentina as a model. After reconnecting with a college friend, Monica invited her to attend Miami Fashion Week in 2011. Her friend’s daughter, Cecilia, attended instead. Cecilia was pregnant, and Monica kept in touch with her after she gave birth to a beautiful baby girl named Valentina. Shortly after Valentina’s birth, her grandmother (Monica’s college friend) called Monica to share the news that Valentina had been diagnosed with Down syndrome. Soon, Monica began to see beautiful pictures of Valentina shared via social media by her family. Monica says she “was taken by Valentina’s beauty, joy, and smile… I was in the process of introducing a new Dolores Cortes line, DC Kids… [and] thought it was the perfect opportunity to reach out, and put Valentina on the cover of the DC Kids USA catalog. In no time, media coverage included The Huffington Post and People magazine. While companies and publications have begun to feature more diverse models in advertising, this is reported to be the first time a child with Down syndrome has been featured as a cover model for a clothing catalog.